Take a bite out of this: the foods that you eat can help build stronger teeth and healthier gums. Proper nutrition is important in the maintenance of your oral health, which means eating a well-balanced diet so that your body can get the essential nutrients needed for good health. The foods that you choose to eat provide the building blocks needed for renewing your body and this includes your mouth. If your diet is low in the nutrients that your body needs, your mouth may have a more difficult time resisting infection. So what are the best foods for your teeth? A healthy diet that is rich in fruits and vegetables, whole grains, lean proteins, and unsaturated fats will benefit your overall and oral health. You can improve your oral health and reduce your risk of developing periodontal disease by eating a well-balanced diet based on the well-known food pyramid. It is recommended that eating a variety of foods from the five major food groups – grains, fruit, vegetables, milk and meat – are highly important. Vitamin and mineral supplements can also help in the preservation of periodontal health in addition to the boosting of overall health and well-being. By offering general dentistry in Westfield, Dr. Krause can help you determine a healthy diet for your needs. Living in a fast food era, it is hard for people to avoid the urge to drink sugar filled soda. Many people will grab a pop, or iced tea instead of water. Pop doesn’t just contain empty calories, but it also contains sugars that can harm enamel, which is the protective shell around your teeth. Over time exposing dental enamel to carbonated beverages and non-carbonated canned ice tea weakens and permanently destroys enamel, according to the Academy of General Dentistry. About 27 percent of the beverages that are consumed by Americans are soft drinks, which have steadily increased over the years and continue to rise. As a result, oral health problems, mainly cavities, have continued to rise every year. Repeated exposure over a long period of time increases your risk of getting a cavity. Drinking pop through a straw may help in reducing the amount of soda that comes into direct contact with your teeth. It is also recommended that rinsing your mouth out with water after drinking and using toothpaste that contains fluoride may also help in preventing further damage from the sugars. 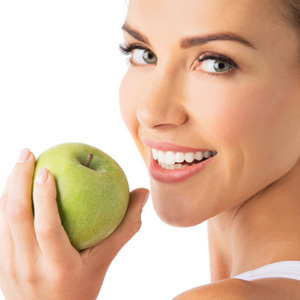 Protect your mouth beginning with proper nutrition and dieting. Contact Dr. Kenneth Krause, your dentist in Westfield, IN, today for advice on proper nutrition and how it can help establish a healthy mouth and body.